Please write “JERRY SHELLHAAS” on the check memo line or in the memo or account field in your online bill payer. Jerry and Gwen attended Toccoa Falls College and majored in World Missions. Gwen graduated in 1985 and served God with World Relief for four years teaching English as a second language to Vietnamese refugees in the Philippines and Hong Kong. Jerry graduated in 1986 and served God for three years as an Assistant Pastor in Greensburg, PA. They were reunited in Reading, PA in 1989, when Jerry accepted the position of Church-Planting Pastor and Gwen came home for a furlough. One year later, they were married and continued in home service for two more years. For reasons they didn’t understand at the time, God closed the door to overseas ministry. They were very disappointed, but determined to be faithful and serve God no matter what, no matter where. They moved back to Ohio to be closer to family and friends and both took secular employment. God blessed Jerry and he moved up the corporate ladder to became a Director of Operations and later Pricing. Gwen also moved up from an Administrative Assistant to a Network Coordinator. 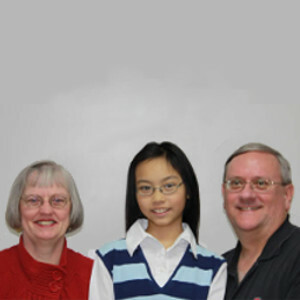 Gwen quit her job in 2005 to be a stay-at-home mom for their newly adopted daughter from China. Jerry’s position was unexpectedly eliminated in 2008 and they again found themselves trying to understand God’s plan. Once again, they determined to remain faithful and seek God’s direction. While Jerry was praying, God prompted him to send his resume to International Friendships, Inc. Jerry didn’t know it at the time, but IFI had been praying for someone with management skills/gifts for several months. They were having a hard time filling the position because it was only part-time. They saw Jerry’s management experience, but then also saw his college education and years of ministry experience. After the interview process and much prayer, IFI and Jerry were both convinced that God had prepared Jerry for this ministry and had directed him to it. IFI offered him a full-time position as both Director of Operations and campus minister, and Jerry accepted. God, in His grace and goodness, directed Jerry and Gwen to IFI where Jerry can use his two strongest spiritual gifts, leadership/management and teaching/discipling. In addition, Gwen uses her skills and experience in TESL and her gift of hospitality as the Shellhaases have students in their home. God is even using their daughter, Eliana, in the ministry. They tell everyone that they are living testimonies to the truth of Romans 8:28 and praise God for leading them to this ministry and granting them the desires of their hearts by bringing the mission field to them. God had a master plan all along!! They are still in the process of funding their ministry and would sincerely appreciate your prayers and financial support.